This week's chart (another from Clark Besch's extensive personal collection) takes us to Maryland where The Monkees have the "Best Bet" with their latest ... but remarkably WPGC is showing "Tapioca Tundra" as the A-Side when clearly "Valleri" (another misspelling) was the hit. Home to Andrews Air Force Base and the Federal Census Bureau, Morningside is a small town of 2000+, but also is just a little trip across the Potomac River to our nation's capital. In 1968, it was also home to a very cool top 40 station, WPGC. You'll note quite a different set of music than last week's Idaho chart displayed. Two of the more obscure but groovy records on this chart blasting the DC area were Nobody's Children's great brassy arrangement of the 1966 Hollies hit "I Can't Let Go" and the psychedelic offerings of Grapefruit and "Dear Delilah." The Nobody's Children record was actually produced by WPGC's DJ Harv Moore and was eventually picked up nationally by Buddah Records. Meanwhile, Grapefruit was an unknown British band then and now well known as a band whose name was given to them by John Lennon. Their music was published by Apple Music in 1968 and despite a great and very Beatlish sounding album released in 1968, failed to gain much success. Their use of phasing on this 45 adds interest and helps add to the psychedelic feel of the time. 2/18/68: David Gilmour replaces Syd Barrett in Pink Floyd after Barrett, who founded the band, was fired for erratic behavior and out of control drug use. 2/20/68: Manfred Mann’s cover of the Bob Dylan tune “The Might Quinn” reaches Number 1 in the UK. 2/23/68: The Jefferson Airplane perform at the very first L.A. Pinnacle Dance Concert, which will continue as twelve monthly events throughout the rest of the year. I was born in 1965 and grew up geeking out on the WKMI 1360 Big 30 survey. I began paying attention in '75 and collected on and off between '75 and when they stopped printing the survey in '79. 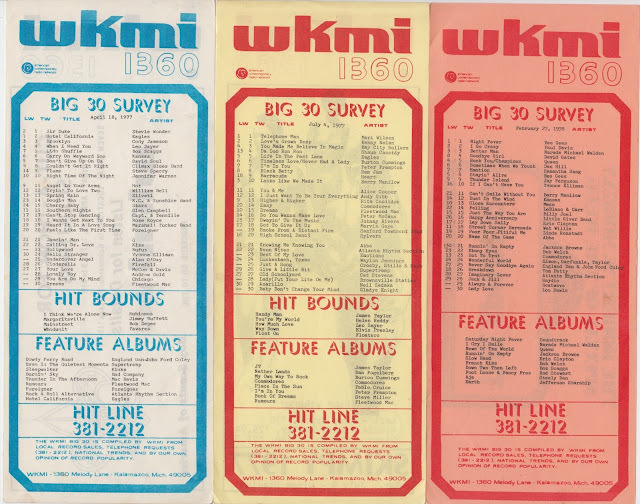 I would be interested in sharing information, images, or trading duplicates with anybody who has WKMI surveys from these or previous years. Possible buying / selling … I'm really quite happy to fill in gaps in my history with copies, too. WKMI surveys go well back into the 1960s; post-1967 is my chief interest. I've attached a couple of survey scans and samples of the format from 1976 to 1979. This year, each survey features flashes back exactly 50 years to that date in 1968 ... what makes this series so special is that during the course of the year, we will be featuring a different survey from all 50 states! Scroll back even further and you'll find our 1967 Series which provided a calendar for the entire year, looking back 50 years. Each week we ran our two major Chicagoland charts (WLS and WCFL) as well as our Super Chart, which shows the combined popularity of these songs nationwide based on information collected from the three major trade publications that tracked these things. Meanwhile, please take some time and continue to make your way through the site ... LOTS of good stuff up here for us survey geeks! 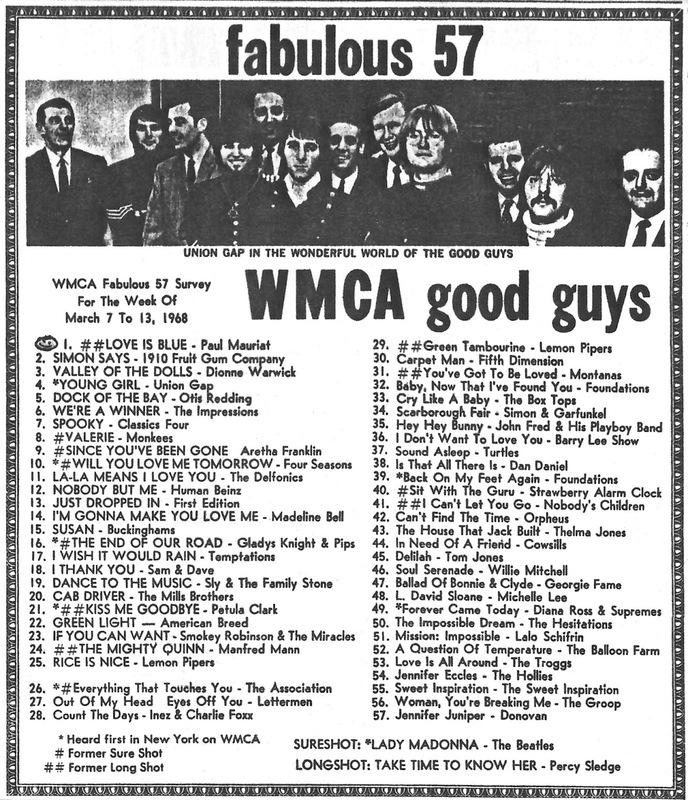 Here is a scan of the WMCA survey I'll be counting down on my Top Shelf Oldies show on March 8th. If you can work this into your Saturday Survey feature around that time, that would be a great tie-in. Thanks! And, speaking of music charts, the King Of The Crop has gotta be Joel Whitburn … his Record Research books have become the Industry Bible for all things pertaining to the national charts … so we were EXTREMELY happy to hear from Paul Haney about their latest release … heading out to the printer now! Just wanted to let you and your readers know that the Top Pop Albums 1955 - 2016 book has FINALLY gone off to the printer. 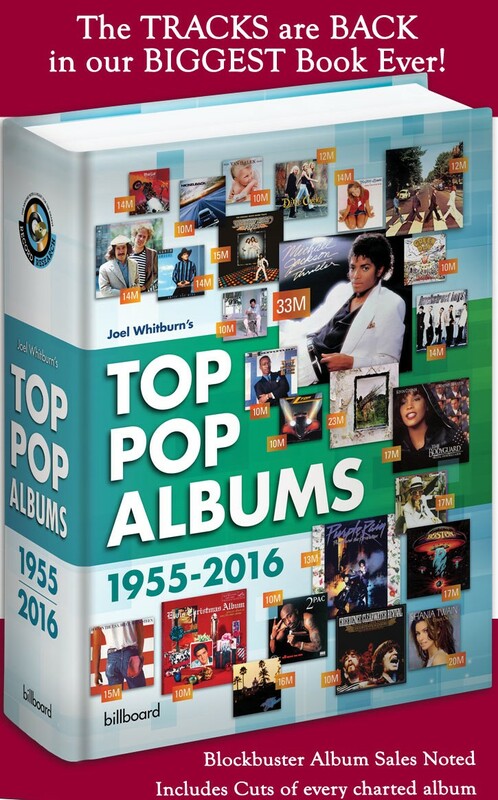 The book is exactly 1,600 pages and lists over 470,000 album tracks! This is by far the most exhausting project that I’ve ever worked on in my 26 years at Record Research. It took almost a full year to finish the weekly research, enter the cuts for over 6,000 new albums, edit the entire book and proof all of the additions / corrections. I hope that everyone who orders a copy will appreciate all the hard work that the Record Research staff put into creating it. The books will hopefully be shipping by mid-to-late March. Because of the sheer size of this particular book, printed quantities will be limited. I love the fact that the tracks are listed with the album lists again … makes life SO much easier than cross-referencing two volumes … but my God, how many more pages can you guys pour into one of these volumes?!?! It’s absolutely massive … and I can’t wait to get my copy. Jp here. Writing in Atlanta with .38 Special. Thx for the heads up re the City Winery bio. Omg! It's being addressed right now. And thanks for posting the Ides Winery Show. You know about "The Songs" Show I’m doing on March 11th at The Chicago Street Theater in Valparaiso, Indiana, right? I've asked Paul Braun to please send Sir Kent of Kent all the info on this show ... as well as info on the Ides Metropolis show on March 23rd. And don't forget we've got another Cornerstones show at The Arcada Theatre on April 29th. The Ides of March always put on an exceptional show … catch them if you can … you will not be disappointed. "The Songs" show is Jim's reimagining of some of his best known hits, all presented in a totally new style. We caught this show last year and it was a blast. Speaking of upcoming gigs, Todd Rundgren will be making his first ever appearance at Austin’s SXSW Festival this year as part of the Cleopatra Records Showcase. Todd’s most recent album, “White Knight,” was released by the label last year. The latest artist to announce their retirement from the road (we seem to have at least one a week lately!) is Neil Sedaka. Since I've started reading I've already gone out and bought "Motown: The Sound Of Young America," a BEAUTIFUL coffee-table type book that is supposed to be the DEFINITIVE history of the label … I've purchased and watched the dvd's spotlighting the highlights of The Johnny Cash Show … (man, Johnny had EVERYBODY on his show … from Bob Dylan to James Taylor to Linda Ronstadt to Creedence Clearwater Revival to Merle Haggard to Neil Young to The Monkees to Kris Kristofferson to Derek and the Dominoes (how many tv appearances did THESE guys do?!?!) to Glen Campbell to Neil Diamond … and on and on and on.) I had to watch these right away … and still think the story about Linda Ronstadt "singing better bottomless" takes the cake! Then I had to finally give in and order The Rolling Stones Mono Box … ALL of their '60's albums collected together into one beautiful box set presenting EVERY track in glorious mono! Did you know that John Perry Barlow, one of the band’s primary lyricists, passed away just this week? I thought you might want to share this with your readers so they will know what this great man did for us all.